I wonder if we might find some insightful parallels and further understanding in the 23 distinct personalities who inhabit the mind of the one main character of the recent 2016 American psychological thriller film Split, starring James McAvoy, and the many personalities manifested through the writings of the Prophet Joseph Smith in the Book of Mormon narrative. 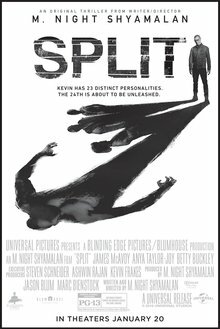 Split (2016 American film) poster, Fair use. Let me be clear. I’m not suggesting that Joseph suffered from dissociative identity disorder (DID) or multiple personality disorder (MPD), as the pathological and mentally ill character is depicted in this film, since that did not seem to manifest at all in Joseph’s daily life. But I wonder if Joseph, in a spiritually constructive and mystically creative way, similarly tapped into many different aspects of his own mind and psyche as he transitioned into deep meditative altered states of consciousness scrying with the seer stone. Perhaps nearly each time Joseph entered that mystical state of consciousness anew, a new personality emerged in the narrative that was dictated to his scribes. I wonder if it would be possible to investigate this possibility given the records we have about the translation timeline and process as it relates to the narrative and the numbers of substantive characters in the book. Did new characters emerge on a nearly daily basis during the translation, or even between intraday translation sessions? In other words, all of the Book of Mormon characters may be many different manifestations, personalities, and perspectives within the single mind and consciousness of the Prophet Joseph Smith, which if accurate would represent an exquisite and extraordinary view, perhaps historically unparalleled in scope and nature, into the variegated and multifaceted psychology of the human being. Of course, authors of novels develop an array of new characters for their stories all the time, but these know they are creating them, even if the characters draw from the authors’ own experience and knowledge, or people they know. In Joseph’s case, the characters may have been unconscious manifestations of Joseph himself, which is remarkable to consider, especially considering the rapid-fire nature of the development of the text. But I understand that such theories represent a drastic departure from previous interpretations, and may frighten some. Many may readily dismiss this, believing that the traditional story of the early 19th century Joseph translating an ancient pre-Columbian Mesoamerican text involving many Christian themes and passages from the 17th century King James Bible originally written in an unknown form of Egyptian delivered on golden plates that had been hidden in a hill in New York for over fourteen hundred years by a now resurrected and embodied angel of a deceased Mesoamerican Christian prophet is closer to reality and truer to life. That’s fine. Some perceive that other possibilities are far more plausible explanations, and I, for one, do not believe they diminish the spiritual value of the work in the slightest, but rather help us come to much greater understanding of God. If nothing else, God is Truth, and I know from sacred personal experience that God may be found only in Truth, not in fables (John 14:6; 4:23-24; 1 Tim. 1:4). The above is not a new theory, it’s been explored in the past by many others, but this particular drama in film seems to bring up the possibility again to consider Joseph in new light, perhaps greater Light. Don’t think that such consideration destroys Joseph’s work, because it does not; rather, it fulfills it (Matthew 5:17). Joseph was far from perfect, but I do perceive he spoke towards the Truth, as many prophet-mystics have testified through the ages. And I add my voice. Nothing in the “Law and the Prophets” is lost in the Truth, but is all accomplished in stunning immaculate Perfection and Infinite Love (Matthew 5:18). Our understanding of human consciousness is only in its infancy, and I think it has very much to teach us about Joseph Smith, the nature of prophets, the origins of Mormonism and religions generally, mystical spirituality in humanity, including how we may approach and enter that Divine Presence ourselves and come to know God.